School tours are a speciality us. At home and abroad, we can help organise the bus hire for a trip of a lifetime that suits all budgets. If your school wishes to travel to an Irish cultural or sporting destination, we have a plan for you with prices to match whatever budget your school proposes. 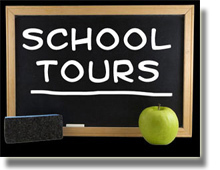 Transfers for school tours to any part of the country can be organised with our company and we will be delighted to quote for any excursion. The popular destinations such as Glendalough, the National Stud, the Delphi Adventure Centre, Tramore , Kilmainham Gaol and Dublin Zoo are hugely successful with school tour groups. School trips to the United Kingdom and Europe can be arranged, which will appeal to school organisers. We also operate school bus travel in conjunction with CIE.